Besides Your Humble Photographer, only one other intrepid stitcher has shown up -- but it was only 8 a.m.! 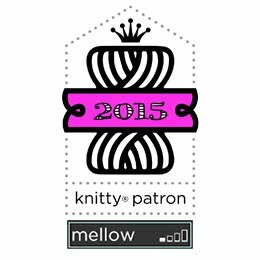 The patterns -- most with accompanying thread packs! -- were all gifts from Thea and her staff. 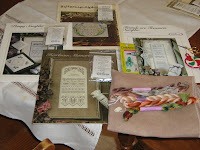 The fabric and thread you see on the bottom right were in my door-prize package! I am beside myself, as there is by far more than enough linen there for a very decent project. Amazing! The wee red, white and green pin-keep you see tucked into the right side of the photo is part of the gift I received at the gift exchange, which took place Saturday afternoon at Thea's home/studio. Each of us was asked to make or bring an item. Accompanying the pin-keep was a tiny pair of gold-coloured scissors, complete with beaded fob! The scissors and keep were from N, an extremely accomplished needleworker, who sat next to me that afternoon. Instead of embroidering the wee wreath that goes over the door of the Gingerbread House in our project, N showed us how she was making it in stumpwork. Fabulous! Of course, no stitching retreat would be complete without a wee bit of shopping. Thea's studio was Open for Business! Given my stash, I was being careful, but I did buy a piece of Thea's I've long wanted (pattern and thread pack): Where Stitchers Gather. I also had her autograph my project piece, the pattern for the Gingerbread House (not shown). 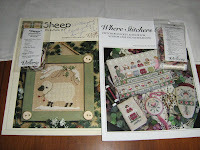 Then I bought a knitter-appropriate pattern designed by Cathy Jean: Sheep -- the pattern, thread pack and accompanying "Bitty Buttons" frame, which I understand Cathy's husband creates with her for her designs. She was delighted to autograph it for me too! Last but not least, a photo of Thea (centre), Lisa (left) and Cathy Jean (right), designers and teachers extraordinaire, whose company and hospitality we enjoyed -- and were spoiled by! -- all weekend. Thanks again, ladies! It was spectacular!